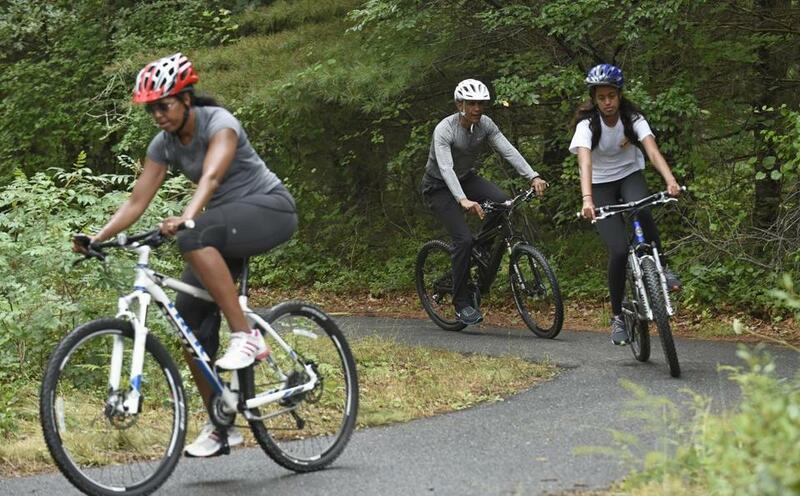 Then-President Barack Obama (center), daughter Malia (right), and Michelle Obama riding bikes in West Tisbury in 2015. Chicago will always be former President Obama’s hometown — that’s where the Obama Presidential Center is being built — but it looks like he may be spending a lot more time on Martha’s Vineyard in the future. Of course, Martha’s Vineyard is home to more than a few celebrities, who enjoy the island for the privacy it affords. David Letterman, Meg Ryan, Carly Simon, Kenneth Cole, Larry David, Seth Meyers, and Bill Murray, among many others, all have homes there. (Murray was Obama’s golf partner at Farm Neck Golf Club last Friday, BTW.) Former secretary of state John Kerry and his wife, Teresa Heinz, recently paid $11.75 million for a house on 18 acres at Seven Gates Farm, a historic property overlooking Vineyard Sound in Chilmark. Former President Clinton doesn’t own a place, but he and Hillary Clinton are frequent visitors to the island, including last week on the occasion of his 71st birthday.